Wago Wall-Nuts® Push Wire® 2-Pole 4-Port Push-in wire connector is perfect for luminaire disconnects. It accommodates three size 16 - 12-AWG stranded copper and size 18 - 12-AWG solid copper conductors wire. 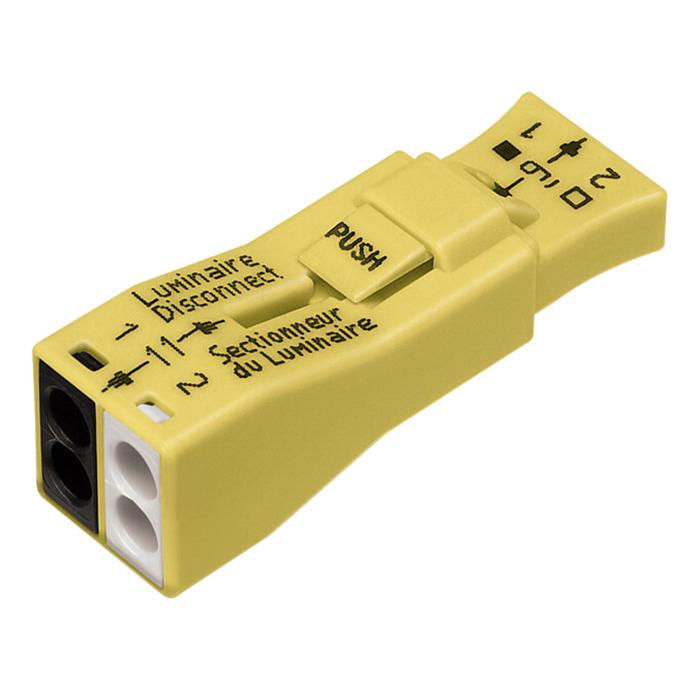 This connector in yellow color, fits through 1/2-Inch knockouts for simple installation. It withstands voltage rating of 600-Volts and current rating of 20-Amps. This connector has a strip length of 0.47-Inch. It measures 0.512-Inch x 1.654-Inch x 0.52-Inch. It withstands temperature rating of 105 deg C. It has V-2 flammability rating per UL94 to withstand harsh environmental conditions. Connector is cULus listed, CSA certified and RoHS compliant.